I read an article yesterday that stated "The trucking industry could have a shortage of drivers in the next ten years" because baby boomers will be retiring, automated trucks aren't being developed quickly enough, e-commerce is up, and there aren't enough younger people getting into the trucking industry. While all of that may very well be true, there is another factor: No one wants to work anymore. Our headquarters office is in Brook Park, Ohio. We're bordering Cleveland, Ohio, for those of you that aren't familiar with the area. The owner of our company does a great job of keeping the building up. A few weeks ago, he decided he wanted to replace the roof. I called several companies, and only two called me back. When they were here, they asked who else I was working with and then proceeded to bad mouth their competition instead of list the reasons we should go with them. I've yet to receive follow-up calls from either company. Last month, we decided to re-surface the yard. I called several companies. Only one called me back, and I'm still waiting on a proposal from them. Last week, we decided to re-seed the grass in front of our office. I've called several landscaping companies. I've gotten one call back. What happened to everyone's work ethic? This isn't just the "young people"; this is a problem with all labor jobs. I know they're not glamorous, they're not exciting, and you probably won't become internet famous because of your awesome roofing skills... But these are jobs that need to be filled by people who aren't afraid to work for a living. Where is everyone's sense of accomplishment? What happened to being proud of how well your business has done and has grown because of word of mouth? 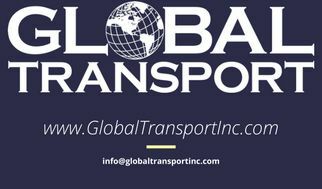 Here at Global Transport, when you call, we answer. Even if 99% of the companies we deal with don't feel pride in their work, we do. And we will continue to be a reliable, trust worthy company as long as we're in business. It's why we've been able to grow so much; because we CARE about the relationships we're building with every single person we come into contact with.